Today was perfect. It was drizzling all day, grey and deserted. My kind of day. Just the perfect fall day. I saw the first signs of "real" fall on the ground. Just a couple brightly colored leaves scattered about from this week's cold snap. Fall always makes me feel great. It's always a beginning for me. It gives me lots of ideas and everything just slows down a little. I'm looking forward to more brisk walks out in this gorgeous grey weather. Welcome, fall. I've missed you. 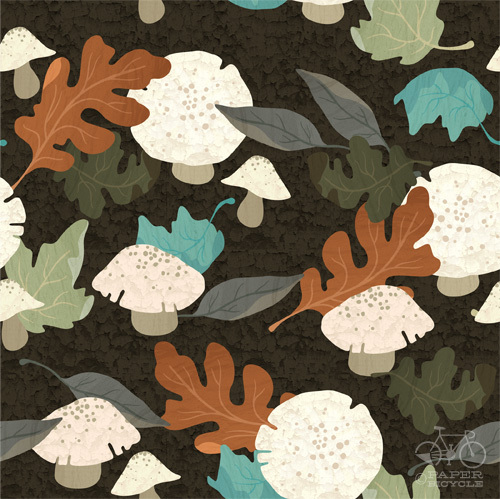 This is a beautiful color palette - this should probably be my umbrella and/or shower curtain haha. Aw, this is exactly what I like to think about when I think of autumn. Delicious woodsy pattern! I love the unexpected turquoise leaves.